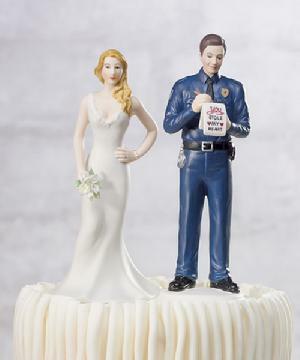 This dapper Police Officer Groom isn't going to let his Bride get away without first writing her a ticket for stealing his heart. Complete with a standard police officer's uniform and heart shaped badge, this Groom can be perfectly paired with any of our Mix & Match Brides. Hand Painted Porcelain. 14.3cm tall.